Dawn and I set off in the dark at 7:15am there was a clear sky and a touch of frost on the car windows, birds were waking up, our first birds of the year were European Robin, Carrion Crow and Common Raven - all three called or sang around our home. We drove to Dorchester and then onto Bere Regis, clocking a number of common birds along the way, Common Buzzard, Common Magpie, Eurasian Jay, Rook, Eurasian Jackdaw, Wood Pigeon, Blackbird and Herring Gull. 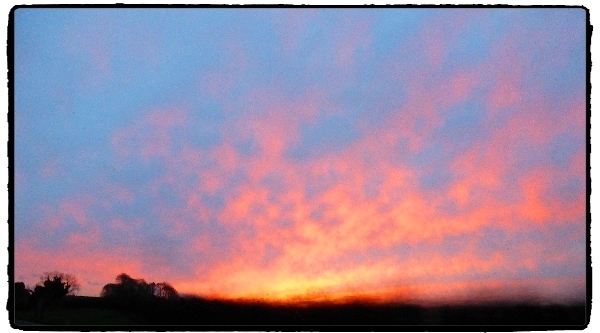 The sunrise was pretty spectacular Dawn took some nice pictures as we approached Bere Regis. 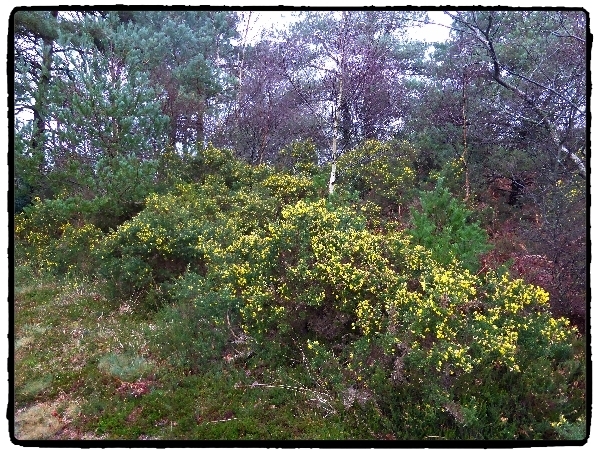 We turned off the main road heading south for Wareham and after a mile we stopped for a walk in Wareham Forest. It was now fully light but it clouded over and remained quite cold. Our walk produced a number of good species but not a lot of the specialist species that I wanted. We found both Great Spotted and Green Woodpeckers, Common Chaffinch, Wren and all five thrushes in one field, Fieldfare, Redwing, Blackbird, Song Thrush and Mistle Thrush. A small flock of European Siskin was last on the list there. 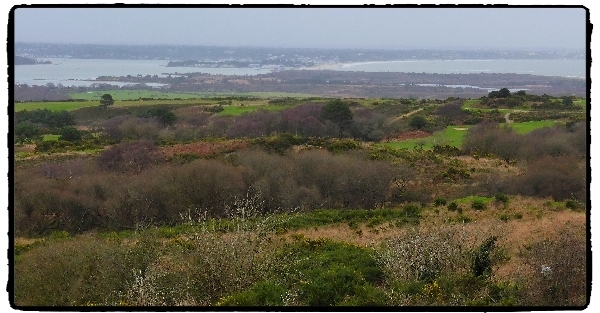 Next we drove to Studland near Poole, we parked near the 'Middle Beach', by this time the wind picked up, it was cold, Dawn was reluctant to get out of the car, sea-watching was the final straw. I spent a hour looking into Studland Bay from two or three vantage points, I couldn't find the Re-necked Grebe that was seen recently. I did list Black-necked Grebe, Great Crested Grebe, Black-throated Diver, Great Northern Diver, Common Scoter, Brent Goose, Mediterranean Gull, Eurasian Oystercatcher, European Shag and a few common passerines. We abandoned our planned walk on the heath to view Brand's Bay and set off for RSPB Arne, we stopped at Corfe Castle for a hot chocolate in the National Trust shop, lovely! On the way to Arne we listed Little Egret, but then the rain started. At Arne car park I ventured out of the car for 10 minutes and only added Eurasian Nuthatch! We ate lunch in the car at 11am, hot soup and rolls, coffee and biscuits, yummy! On the way from Arne a Hen Harrier flew alongside the car and over the track, my bird of the day. We travelled through driving rain to Weymouth where a very brief stop at RSPB Lodmoor resulted in 5 new birds for the notebook, Grey Heron, Common Coot, Common Moorhen, Common Shelduck and Gadwall. We then drove round to Ferrybridge which is found on the causeway to Portland, Dawn refused to get a soaking so I listed Dunlin, Ruddy Turnstone, Common Kingfisher and Red-breasted Merganser by myself. Our last stop was at Portland Castle where I scanned the harbour, I found Great Northern Diver, Razorbill, Red-breasted Merganser and lots of European Shags and Great Cormorants. Pied Wagtail was our very last bird of the day, seen as we left Portland Castle, it was only 1pm but it was dark, wet and very windy, we had had enough! Our list of 60 soecies was my lowest list for January 1st ever.